Roof Deck Protection is one of the most important Roofing Products you can have installed. 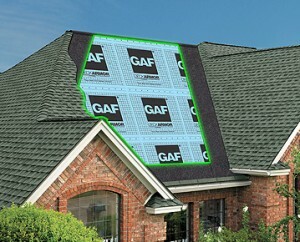 GAF offers Shingle Mate which is a “tar or felt paper” that is applied between the shingles and the roof deck. Roof Deck Protection is installed as an extra layer of protection for your home. It helps stop any wind driven rain, hail and snow from getting underneath your shingles and eventually cause damage. It will also lay flat and uniform to give that seamless and professional look, unlike other conventional organic felt. If you are looking for more information on other GAF Products that are part of the Lifetime Limited Warranty call 519-268-6331 or fill out our form to book an Appointment.